<<<<<<<<<< The navigation list in the left margin under the heading Flap Wheels lists five styles of flap wheels. Click on the style you seek. Mounted flap wheels come with a 1/4" straight shank. 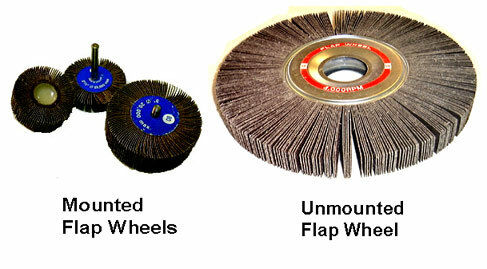 Unmounted flap wheels have an arbor hole that allow the wheel to mounted on tool shaft. Inline nonwoven flap wheels are for pure surface conditioning without abrasive cloth.